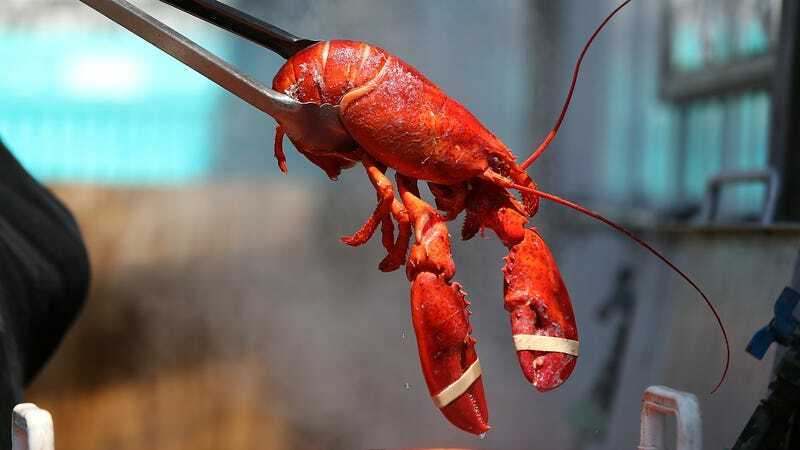 A trip to Maine is on my travel bucket list, and not least of all because the minute I step off the airplane, I plan to mainline some fresh crustacean meat straight into my bloodstream. (With a drawn butter chaser.) Seafood—lobster, especially—is big business for Maine’s fishing and tourism industry, which is why People For The Ethical Treatment Of Animal’s new anti-lobster airport ads have some locals boiling mad. The Portland Press Herald reports PETA’s ads went up this month at the Portland, Maine airport to coincide with the state’s annual Lobster Festival. The ads depict a lobster holding a sign that reads: “It’s Me. Not Meat. See the individual. Go vegan.” According to a Colby College economic impact study, the lobster-industry supply chain contributes $1 billion annually to Maine’s economy. Still, the ads will remain up through August, PETA tells The Press Herald, and are strategically located near Linda Bean’s Maine Lobster Cafe, which sells live lobsters for passengers to bring home in their carry-on. (What a time to be alive, etc.) PETA says its investigations have found cases of animal cruelty at Linda Bean’s processing plant. For the record, The Takeout staff urges you not to cook your own lobster, but for reasons unrelated to PETA’s grievances.